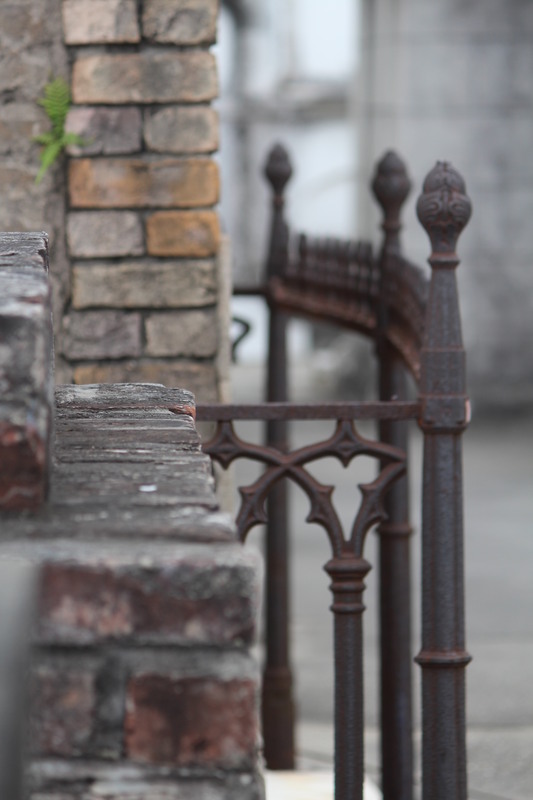 Iron works in New Orleans’ French Quarter | Oh, the Places We See . . .
An iron maiden adorns the rim of a pool against a mural in the French Quarter near Cafe du Monde. It takes maybe oh, um a minute or two at most upon leaving your hotel in New Orleans’ French Quarter to realize that ironwork is everywhere. Not just iron. But works in iron. 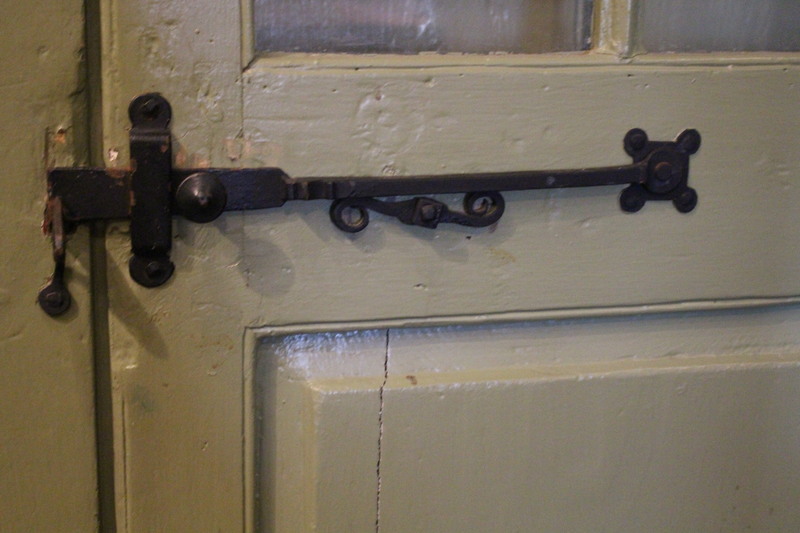 You know, handcrafted, aged, forged ironwork so hard to duplicate today, but so desirable, especially if you live in the Deep South. 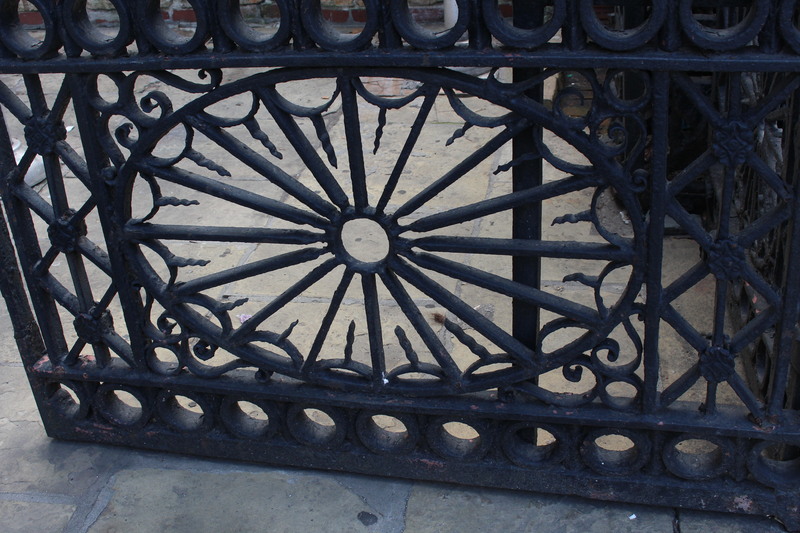 In fact, you may have first seen the ironwork as you drove into the Quarter. Balconies framed in ornamental iron. Fencing around commons areas like Jackson Square. And horse head poles where steeds bearing tourists in buggies are tethered. 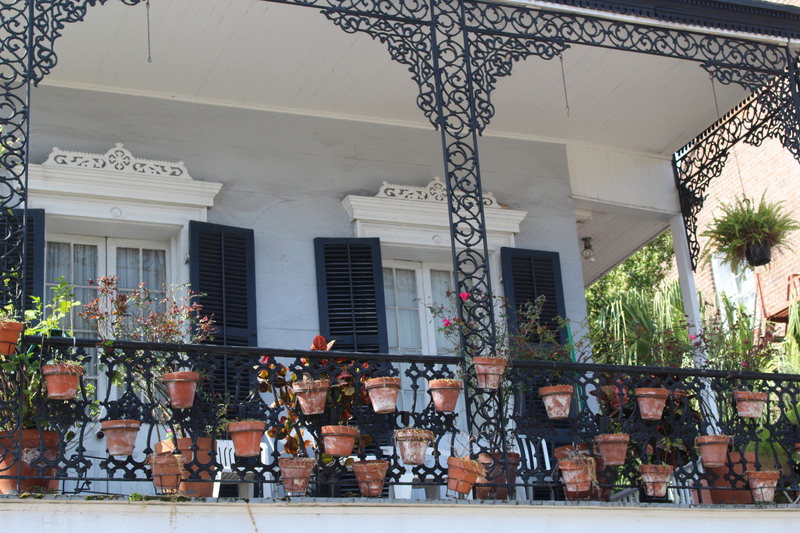 You may have even pointed out railings bearing moss-lined planter baskets and the like, because that one vignette reminds you of all the pictures of the Deep South you can think of. 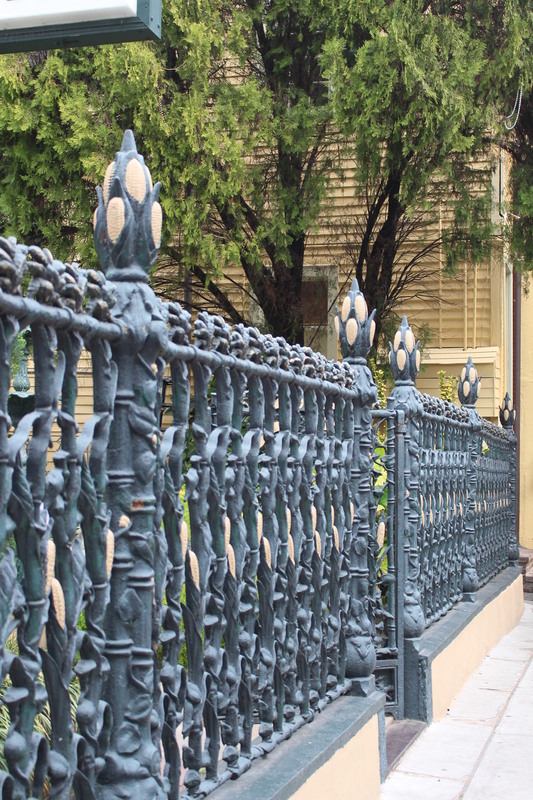 Wrap around, ornamental ironwork on a classic two-story home in the New Orleans French Quarter. 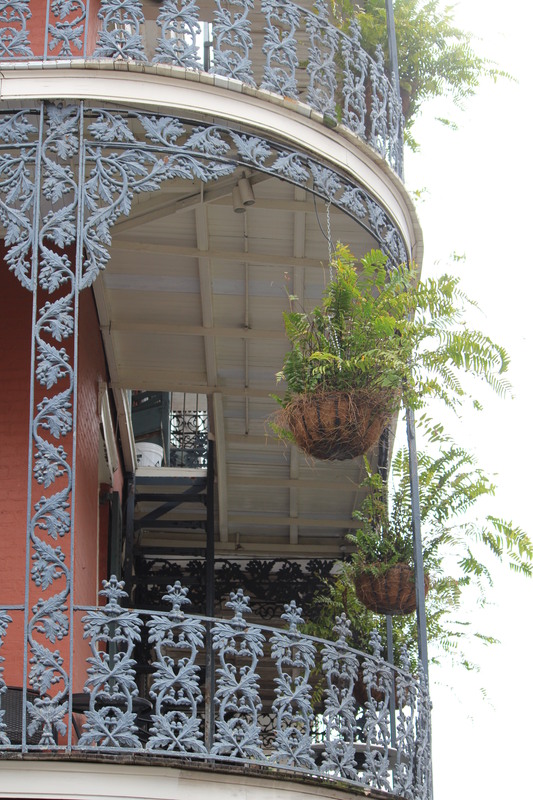 Baskets hang from ornamental ironwork in New Orleans’ French Quarter. 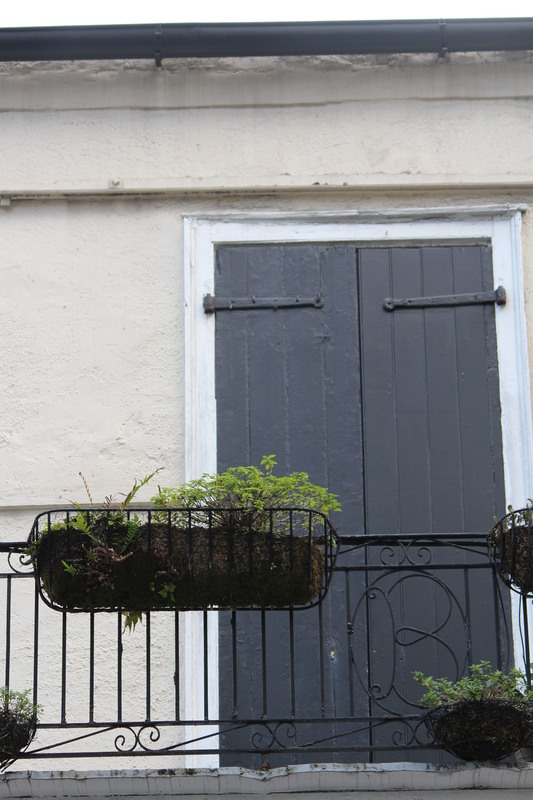 Painted black shutters form a backdrop for this monogrammed ironwork and hanging basket. 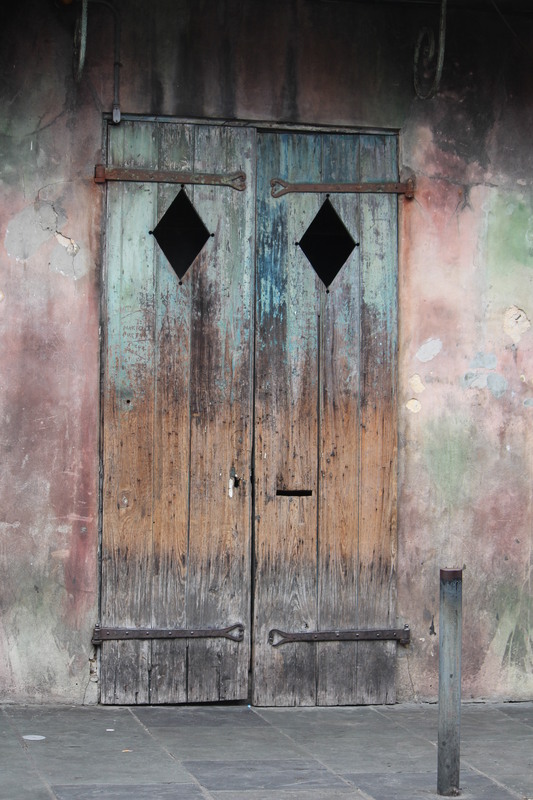 When you walk through the quarter, though, you take a closer look. There’s ironwork in most places. Like around Jackson Square where sturdy ornamental poles hold street lamps in sentinel fashion. And fencing becomes appreciated for its artiness as much as a boundary for this holding place for Jackson astride his trusty horse. 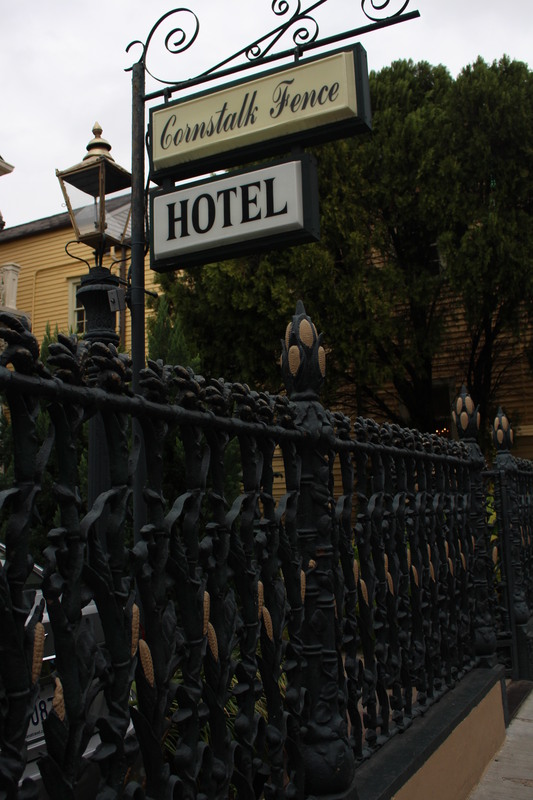 Perhaps the ultimate iron work stands guard around the Cornstalk Fence Hotel where (what else?) 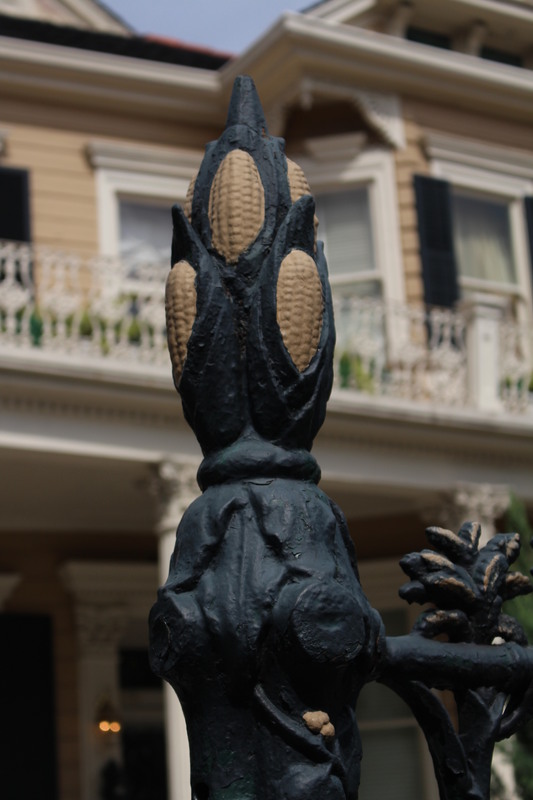 the Cornstalk Fence offers photo bugs a chance to gawk and shoot at will. This French Quarter Victorian built in 1840 has been home — at least for a night or two — to Bill and Hillary Clinton and even Elvis himself! But it’s the fence that drew us in with its embellishments of painted well-formed stalks of corn and curlicue vines along the way. 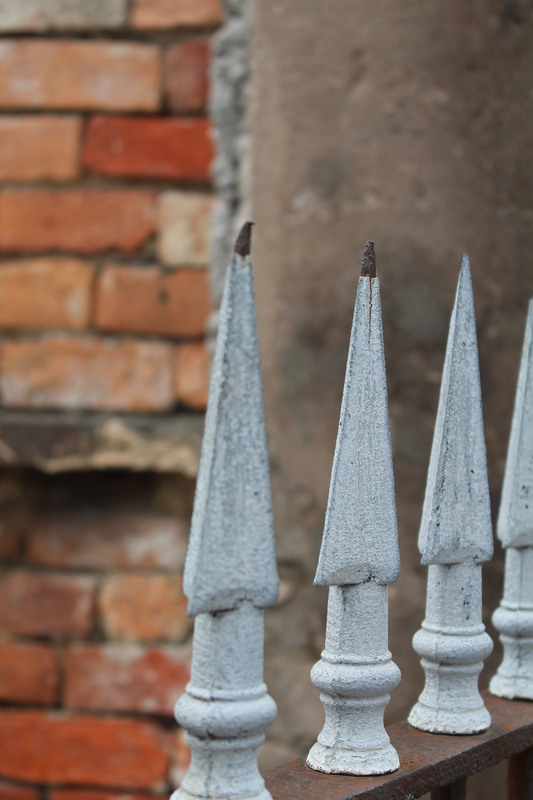 But as you walk narrow streets, you can’t help but notice fences . 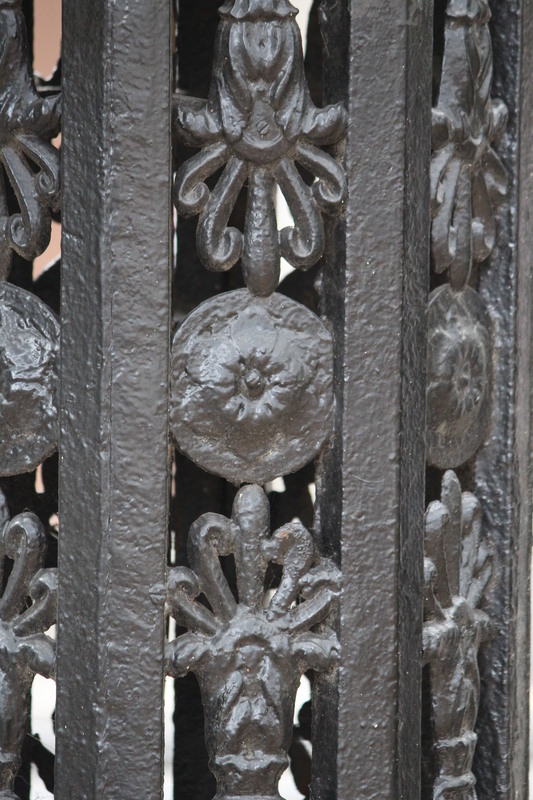 . .
An up close look at beautiful ironwork in New Orleans’ French Quarter. and rods adorned with fleur de lis. Right beyond the Quarter, but perhaps officially in it (I don’t really know), lies St. Louis Cemetery 1, the city’s most famous cemetery and home to thousands of bodies of residents both wealthy and poor. (A future blog will cover more of the tombs and aging structures in this place now open only to guided tour groups.) 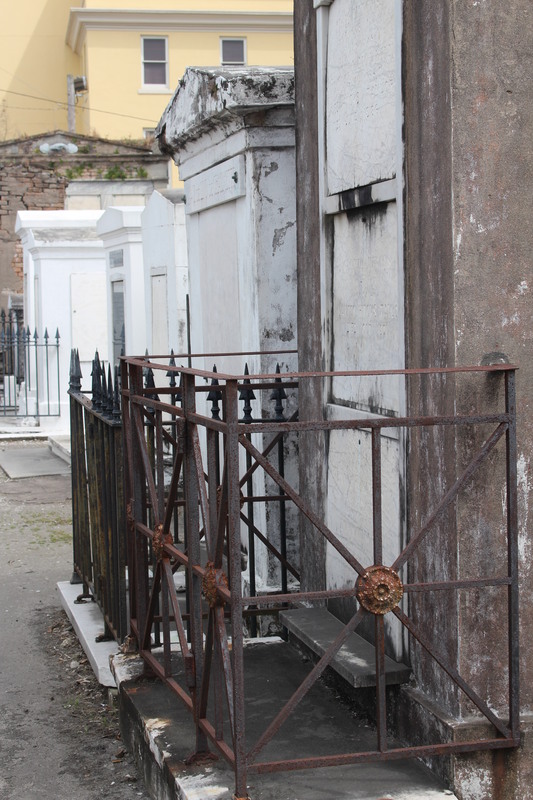 Ironwork still stands — mostly erect and stable — around the crumbling tombs, a testament to the resourcefulness of those who wanted to be remembered in perpetuity and to the art of the iron workers in the late 1700s. 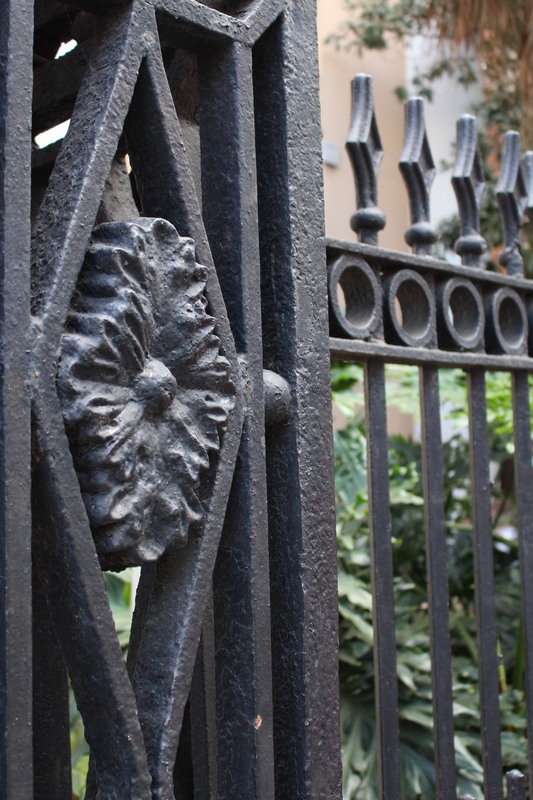 No matter where you stroll in the French Quarter, you’re sure to be amazed at the craftsmanship and Old World beauty of its ironwork. Thanks for traveling through New Orleans with us. 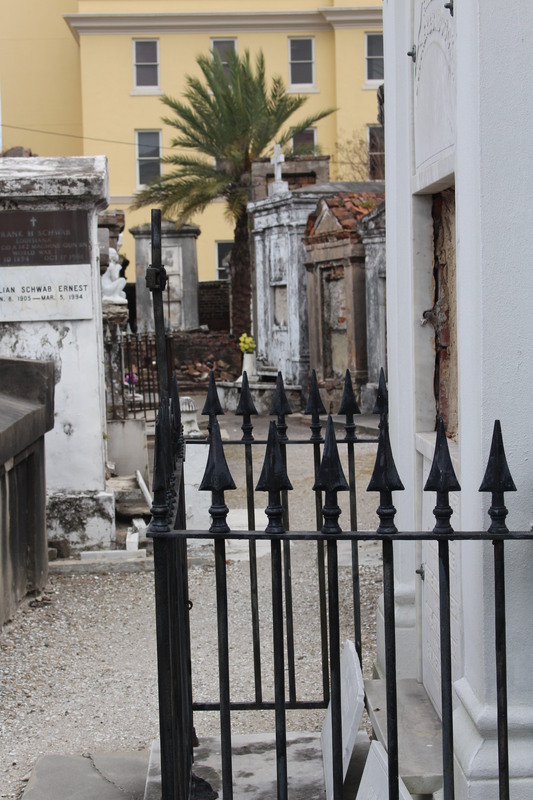 Hope you’ll take a look at our other posts under Travel Series, New Orleans. Or check out photos on Flickr. 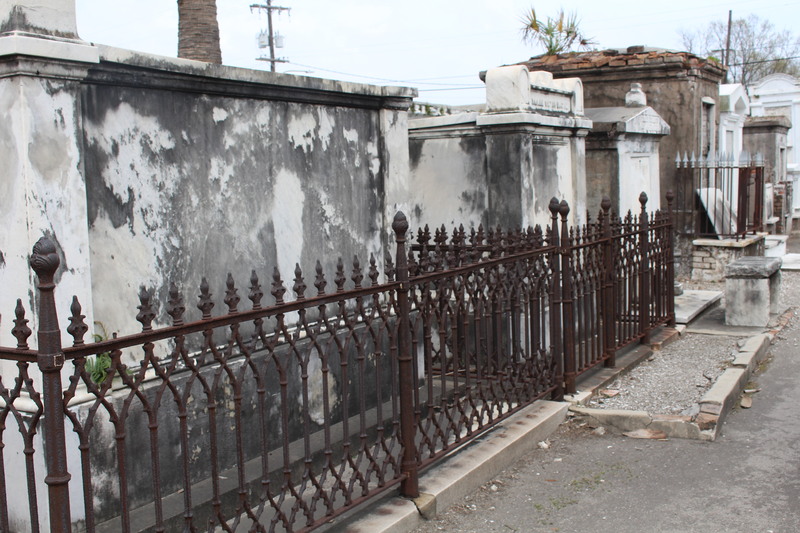 This entry was posted in Louisiana, New Orleans, Travel and tagged cornstalk fence, Cornstalk Fence Hotel, fence, French Quarter, ironwork, Jackson Square, New Orleans, St. Louis Cemetery 1. Bookmark the permalink. Kevin, for some reason, I’m just now seeing your comment in my email box! Thanks so much for taking the time to look at the post and make a comment. You’re absolutely correct: people probably did take it for granted. 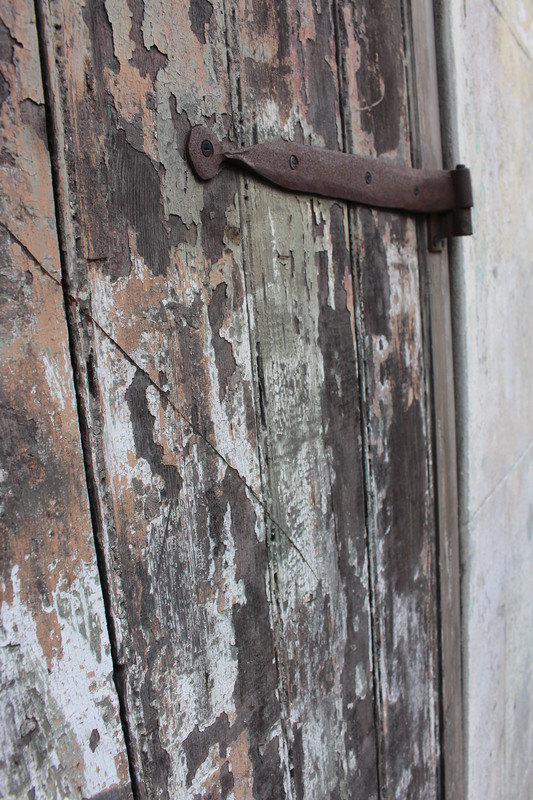 And even now that it’s old and rusted and still classy, most of us just walk right by. It’s always good to hear from you, even if I’m late in responding!!! Love the close-up shots of the iron works of art. What detail! Hah! I’m learning there’s no shame with photography! Glad we could oblige, Pit. And wish we could travel and write a lot more. It’s always good to get away to New Orleans. I, too, wish I could travel more! My favorite photo out of this set is the doors with diamond cutouts. LOVE the colors in that shot! I’ve only been to New Orleans once…we saw some of what you’ve seen. It’s striking, isn’t it! Looks like you’re having a great time! Those doors are terrific! 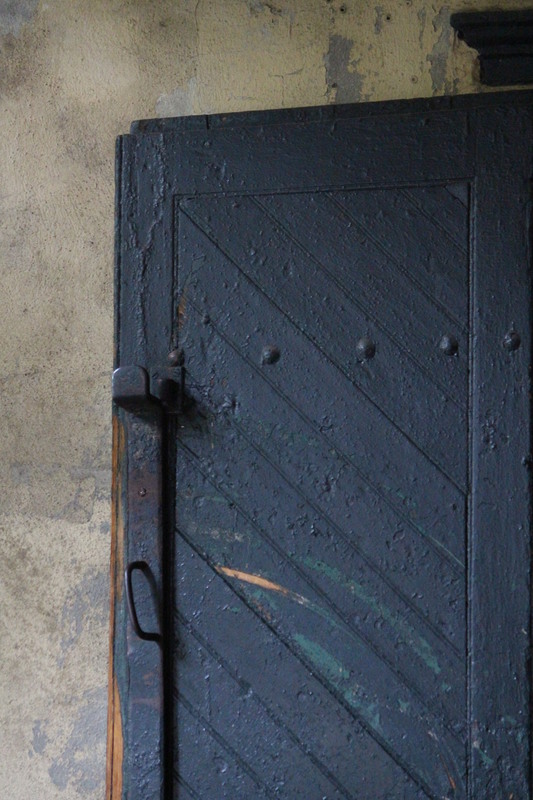 From the color to the aging to the ironwork. Thanks for commenting. And, yes, we had a great time — just now writing about the trip. I have a hard time composing at night when we travel — I’m just so tired! So there’s always a bit of a delay. Still fun to look at pics again! Thanks, Amy. 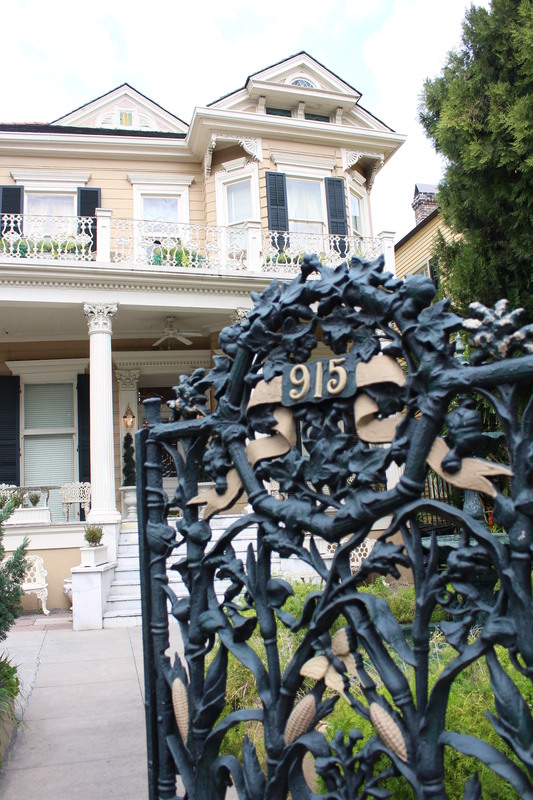 We’ve been to NOLA many times, but this time the ironwork just stood out. I started photographing and found a lot to take pictures of! Appreciate the comment.